Gov. Shumlin looks on as his secretary of human services, Hal Cohen, describes the administration's new goal. Governor Peter Shumlin announced a $580,000 grant on Monday that will help the Committee On Temporary Shelter (COTS) complete its plan to build 14 affordable apartments and a day station where homeless people can eat lunch, use computers and access other resources. The North Avenue project met with resistance from neighbors but won approval from the Burlington Development Review Board last December. COTS has now secured 90 percent of the funding for a project expected to cost approximately $6 million, according to Kathy Beyer of the nonprofit Housing Vermont, which is partnering with COTS to develop the site. The future apartments — 10 studios and two one-bedrooms — will likely provide homes for individuals rather than families. The town of Williston had applied for the federal funding on behalf of COTS. 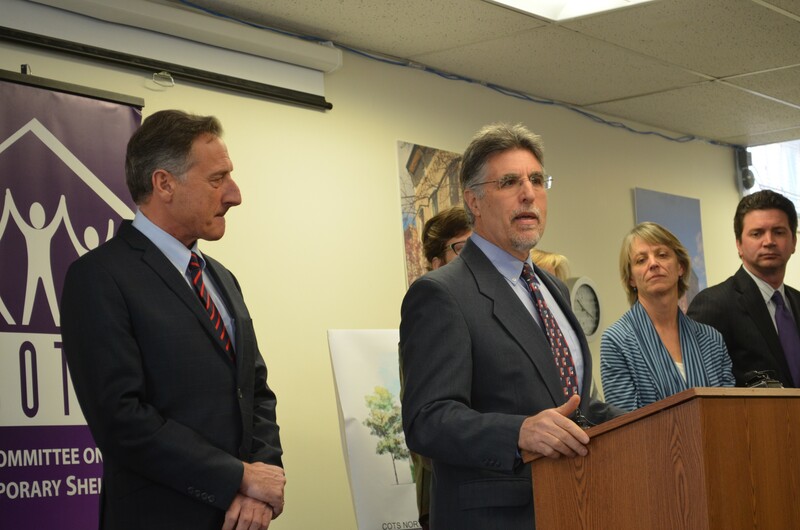 At the same news conference, Shumlin unveiled a plan to move all homeless families off the streets by 2020. The three-part strategy consists of creating a single assessment process for homeless families; prioritizing families when subsidized housing becomes available and offering them supportive services; and encouraging the construction of more affordable housing. "Let's be clear, this is an ambitious goal," said Hal Cohen, secretary of the Vermont Agency of Human Services. To achieve it, Cohen said, AHS will need to be more aggressive about applying for federal grants and must improve coordination between the relevant federal and local agencies. Shumlin is not the first public official to set this kind of goal. In response to a campaign that began in 2000, well more than 200 communities across the country have set concrete timelines for eradicating homelessness. Burlington drafted a 10-year plan to end homelessness in 2004. In 2013, Shumlin himself signed on to another plan, developed by the Vermont Council to End Homelessness. Piping up from the back of the room, Linda Ryan, the executive director of the St. Albans homeless shelter Samaritan House, acknowledged that homeless numbers are growing. But, she said, "Don't be fooled. We are making significant progress."